“Master Trainers” on Tuesday signed contracts to begin working with Mathematics teachers at public secondary schools across the country to improve the delivery of the subject and the performance of students. 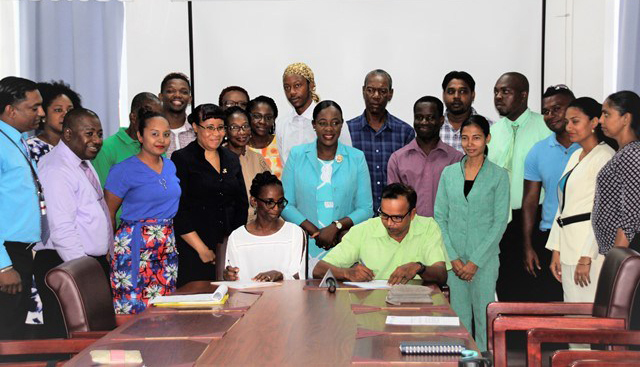 The Ministry of Education-led initiative forms part of the World Bank-funded Guyana Education Sector Improvement Project (GSEIP). In a press statement issued on Tuesday, the ministry said 29 Master Trainers will be tasked with training over 600 mathematics teachers within the 10 regions, after which the teachers will undergo a period of mentoring and coaching. Senior Education Officer (Mathematics) Ameer Ali noted that the Master Trainers include some of the best teachers at the CSEC and Grade Six levels. Among them, he said, are lecturers at the Cyril Potter College of Education (CPCE), the University of Guyana and some teachers who have attained over 10 years of experience teaching Mathematics. Ali explained that the Master Trainers will now be required to go into schools and guide the teachers using material from the mathematics kit that has already been distributed to schools across Guyana. He said based on observations made by the Master Trainers, they can host developmental sessions with teachers or it can be done regionally. This, he said, will occur over the next two years. Meanwhile, the statement said Minister of Education Nicolette Henry congratulated the Master Trainers for taking up the leadership roles to move the education sector forward and take it to a better place, particularly as it relates to the delivery of Mathematics and students’ performance in the subject. Henry said that it is important that teachers understand delivery and content so that students can leave school with a good understanding of the principles that govern mathematics. She added that she expected that there will be improved performance and outcomes, not only in test scores but in behavioural patterns towards mathematics. According to the statement, Henry also said she is pleased that there are male Master Trainers involved in the project since their presence will have “a greater impact along the gender spectrum as it relates to male underperformance,” particularly in the secondary school level. The Master Trainers previously underwent training themselves in order to deliver in-service training to public secondary school teachers under one of the components of the GSEIP. The objective is to improve content knowledge and instructional skills of secondary school mathematics teachers to enhance their effectiveness in the classroom.